Civil War II has already torn the Marvel universe into two conflicting sides, and claimed the life of the Hulk himself. But its latest portent of doom promises to be its biggest and most polarising yet. 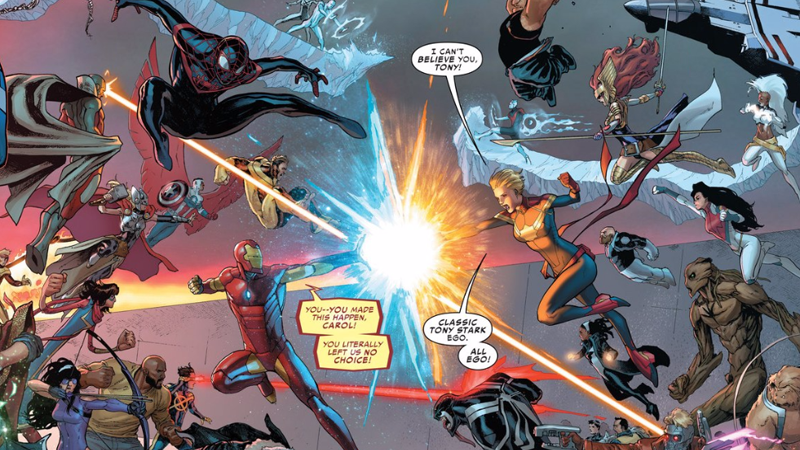 Written by Brian Michael Bendis and with art from David Marquez, Sean Izaakse and Justin Ponsor, Civil War II's fifth issue, out today, sees Inhuman precognitive Ulysses experience another major vision amidst a scrap between Carol and Tony's warring factions. Miles Morales, standing over the battered, dead body of Steve Rogers. One of the Marvel universe's youngest heroes will supposedly bring down one of its oldest. There's no explanation given for why Miles would kill the original Captain America, although his secret "new" history as a longtime Hydra agent seems like an obvious one. But this moment — one that sees the superhero world divided about how to stop one of their own from being a killer — is one Marvel has been teasing practically since Civil War II was announced. Ulysses' past vision didn't come to pass, but only because the Hulk was murdered before it could. Let's hope the same doesn't happen to the next generation of Spider-Man. 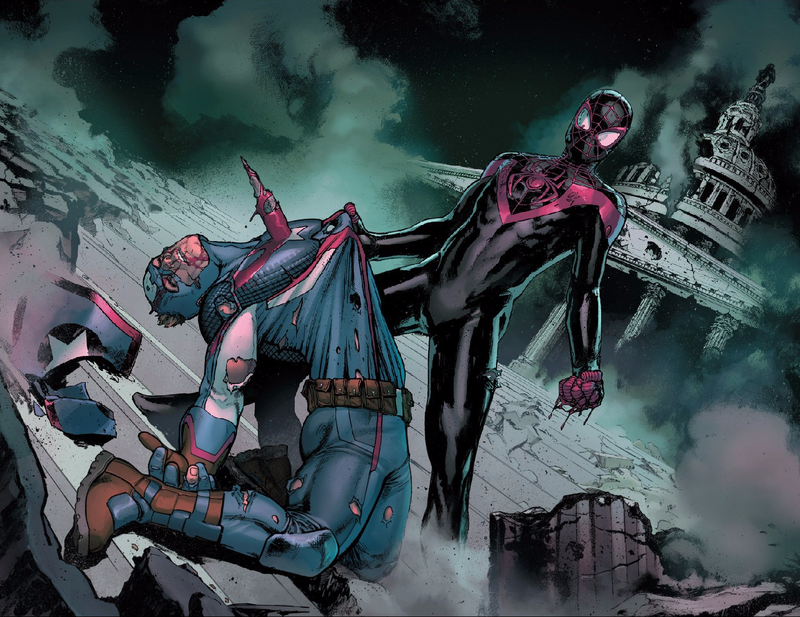 OR!, Miles is delicately carrying Cap from the battlefield and they are all jumping to conclusions? That's not the white house, that is the Capitol Building. But your point is made. I like how there's a spoiler warning AFTER the massive spoiler about the Hulk. Oh, and the Hulk wasn't murdered. He was euthanized at Banner's own request. Regardless, this whole series is just more lazy Bendis writing. He really should stick to solo books like Alias and Spider-Man where his talent is more obvious. Civil War II reads like he phoned in the plot.